As we walked through Rome, searching for the Trattoria Der Pallaro, anticipation began to build. After exiting the Campo de Fiori, a modest piazza by Rome standards whose hallmarks are a daytime market and a statue of an excommunicated Dominican monk burnt at the stake centuries ago in that very spot, we took a wrong turn. The often warren-like streets can be challenging even with a GPS for guidance. But if we had to search every side street in the area and spend hours doing it, we weren’t giving up the quest. This wasn’t just any restaurant we sought. This was a restaurant I had waited to return to for fourteen years. After all this time, I vividly recalled arriving at the trattoria, a haven on a chilly, rainy March night. 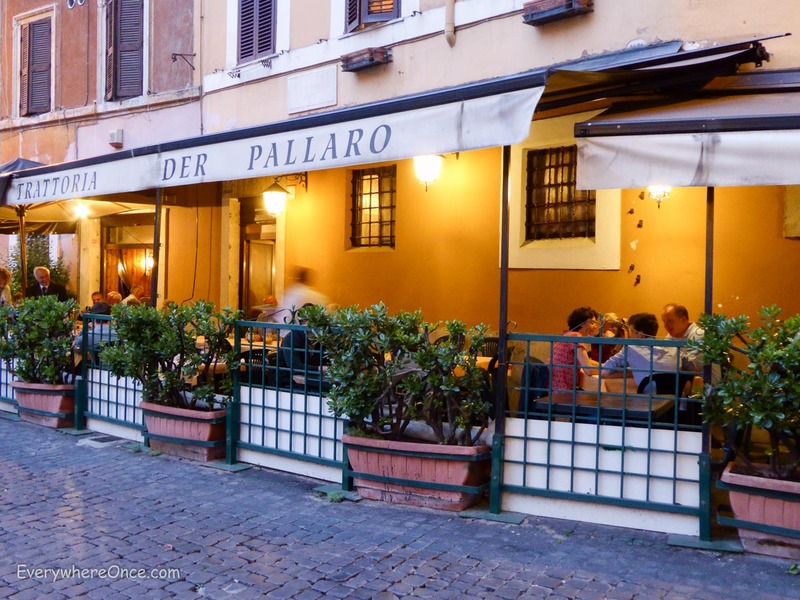 We sat in a cozy, wood-paneled dining room with friends, one of whom had come across the listing for Trattoria Der Pallaro in a Frommer’s guidebook as the “Best Value” eats option in Rome (it’s still their pick). The wine began to flow and, with barely a word exchanged between diners and servers, platters of food began arriving at the table. When we finally found the place this time, we were met with a kindly greeting, part in Italian and part in English, along with a gentle pat on the arm by the restaurant’s proprietor, Paola, who is in her early 80s. Wearing her signature kerchief wrapped around her head, she shepherded us to a table on a patio outside the restaurant’s front entrance. Unlike the blustery weather during our previous visit, warmth permeated the air, and the summer evening light was beginning to fade as we eagerly awaited the feast we knew was coming. We just didn’t know exactly what. Plates about to be piled with antipasti. Tratoria Der Pallaro is perfect for the indecisive. There are no menus here. Diners are served a set offering that rotates given the day. The only choice to make is red or white. 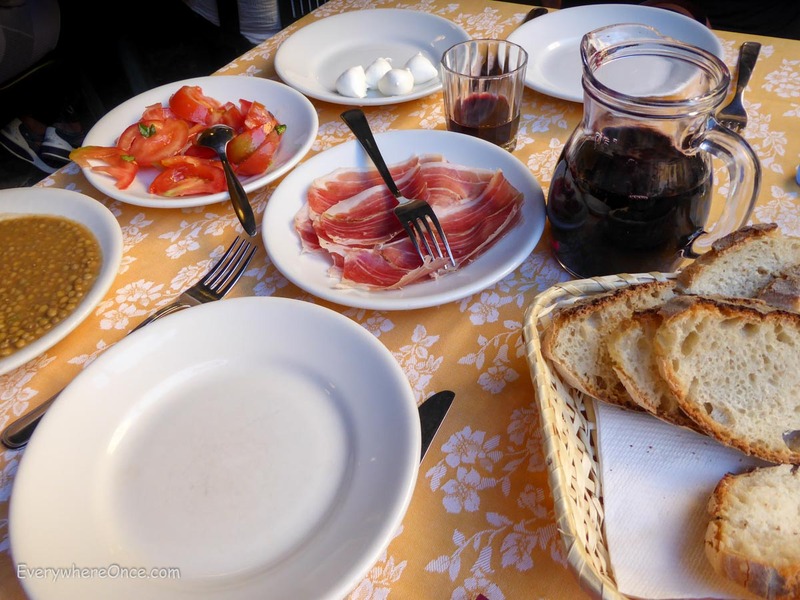 A carafe of vino rosso swiftly appeared at our table, followed by a bountiful selection of antipasti—slices of prosciutto, mozzarella balls, tomato salad, a bowl of lentils and, as a chaser, fried rice balls. Not one but two kinds of pasta, along with a tumbler of red wine. No fancy stemware here. The next course we didn’t have to share. Placed in front of each of us was a bowl cradling ample, side-by-side servings of two different kinds of pasta: one with a tomato cream sauce and the other a decadent carbonara studded with caramelized pieces of ham. 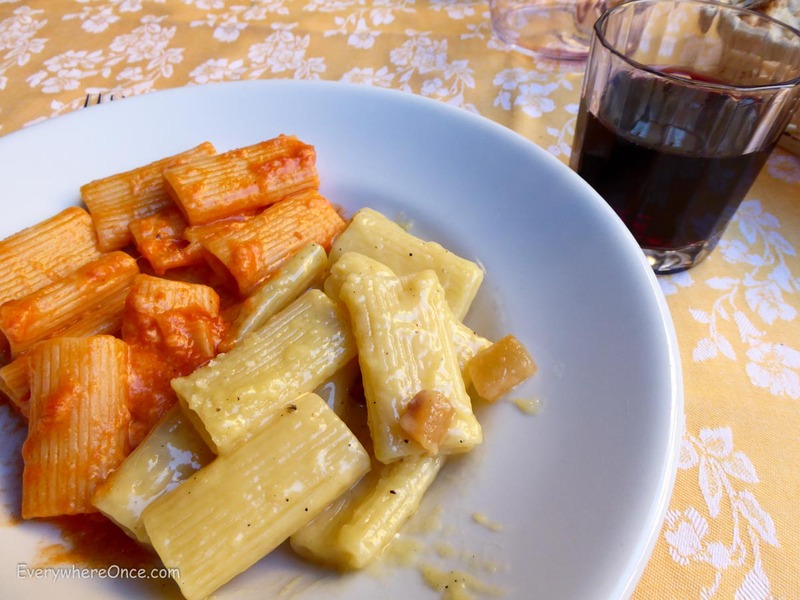 They were by far the best pasta dishes we had during our time in Rome. We rarely follow the Italian tradition of ordering both a primi (pasta) and a secondi (meat) course, as it’s too much food for us in a single sitting. But tonight we indulged and savored the next round: roasted pork with greens and homemade potato chips. Rounding out the meal were slices of apple tart and a glass of fresh-squeezed mandarin juice. Our next-to-last course, the secondi, and the final photo we took of our meal. We were too busy eating dessert to document it. What makes Trattoria Der Pallaro a memorable and fun experience is the excitement of not knowing what will turn up at the table, enhanced by the delicious, generously portioned food and the hospitable atmosphere. Somewhere in the midst of all those courses our carafe ran dry. Signaling the waiter, we asked for a refill. “Sure. Why not?” he responded cheerily before dashing off to fulfill our request. At a set price of 25 euros per person, it’s not exactly a budget option, but it is excellent value for the amount of food and drink. Four courses plus bread, water, wine, and more wine served in a charmingly informal and friendly environment. Later in the evening, when we asked to settle up, the busy waiter paused mid-dash with tray in hand. No paper bills here, he simply told us the tally was 50 euros. We gladly paid the tab plus a tip (in cash, no credit cards accepted)—for not only sating our appetites but for living up to fourteen-year-old expectations. Was Trattoria Der Pallaro worth the wait? Absolutely. Just be sure to arrive hungry. There is nothing like dining in Italy! I really want to go back! Beautiful pictures and post. and how about i dolci (the dessert) ?!?!? !